Sign up to get the latest posts and thought leadership directly to your inbox. How Many Pennies Equal a Dollar? Marketers are constantly trying to figure out how to adjust their email programs to accommodate for new trends and engage consumers. Mobile has dominated that conversation for some time, but as mobile usage flattens the conversation is shifting to what’s next for email marketers. The shift we’re seeing amongst our clients is towards a content-first approach. The effectiveness of a content-first approach can be validated by looking at the performance of triggered emails over time. Marketers continue to leverage triggered emails, which take in to account information based on a specific action or interaction, to engage with customers. 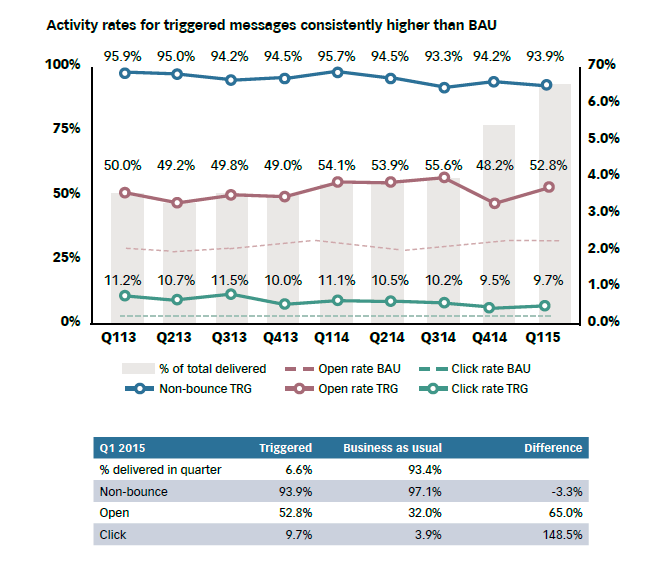 Activity rates for triggered messages are consistently higher than the activity levels for business as usual (BAU) messages. As the consumer’s path-to-purchase continues to get more complex, it is important for marketers to begin to truly drive a content-first approach in an effort to deliver better customer experiences across all channels. Triggered email messages are just one example of how effective the email channel continues to be in engaging consumers. *Epsilon’s triggered email metrics are compiled from approximately 600 million triggered emails sent in January 2015 to March 2015 across multiple industries. These messages were sent as the result of a consumer action, such as Welcome, Thank You, Abandon Shopping Cart or Confirmation. These metrics also highlight significant differences between triggered email performance and BAU email performance. Because of the lower volumes being reported on, we expect to see quarterly fluctuation as clients target and market to their audience in different ways throughout the year. The Marketing Technology Awards 2019: And the winners were..
Is your email strategy inclusive? Copyright © Epsilon 2019 Epsilon Data Management LLC. All rights reserved.